St Eustatius or Statia is an island of 21 sq. km with a population of around 2100. It is elongated northwest along the axis of the northern Lesser Antilles and measures 8 km NW by 3.5 km and comprises two morphologically distinct units. 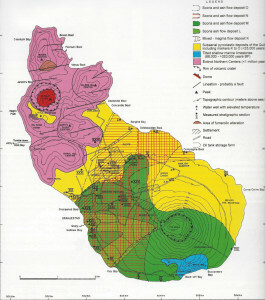 The north-west end comprises a cluster of five coalesced older volcanoes built of lava flows and Pelean domes and their pyroclastic aprons of block and ash deposits. These are best seen in the island sea cliffs. The five centers are extremely youthful (less than one million years and too young to be dated by the K-Ar method) and occupy an area measuring 4.0 by 2.5 km and rise to 289m a.s.l., and have been called the Northern Centers. From north to south they are the Boven, Gilboa Hill, Little Mountain-Pisga Hill-Bergje dome complex, Mary’s Glory and the Pilot Hill-Signal Hill centers. The Little Mountain- Pisga hill center contains an 800 m circular crater in its north-eastern part inside of which is the Bergje dome. 2.5km to the south east of the Northern Centers lies the 800m wide open central crater of The Quill volcano – a simple young stratovolcano with flanks that sweep up to angles of 50 degrees at the crater rim. 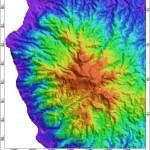 The crater floor is at an elevation of 278 m and the highest point on the crater rim is at 600m. The crater has a prominent breach or low point on the western side beneath which a prominent pyroclastic flow fan is directed to the west coast and on which the islands main settlement of Orangestad is situated. The subaerial flanks of the Quill have been largely removed by erosion except where they form a platform linking northwest to the Northern Centers. The Quill, apart from a few lava dome remnants exposed in the inner walls of the crater is almost entirely a pyroclastic volcano and the seacliffs cut into the flank deposits reveal some of the best pyroclastic sections in the Lesser Antilless. These are accessible by walking along the beaches. The Quill is almost entirely composed of varied pyroclastic deposits representing five styles of pyroclastic activity: Pelean-, St. Vincent- ; pumiceous Plinian-style activity, semi-vesicular andesite Asama- style and phreatomagmatic activity. The deposits of the Plinian style activity are very striking and best seen in the seacliffs below Orangestand on the west coast and in Bargine Baai on the east coast, as white pumiceous lapilli airfall and ignimbrite (pumiceous pumice flow) deposits. Fine grained and thin bedded pumiceous ash fall and surge deposits from the collapse of Plinian eruption columns (up to 50km high) have been exposed where an oil storage facility has been constructed on Pisga Hill in the Northern Centers. These ashes contain powdery carbon and the remains of hermit crabs in seashells (latter swept up and transported by the surges). The ashes indicate that during Plinian activity the entire island can be swept by ash cloud surges resulting from the collapse of the Plinian eruption column. Radicarbon dating of the pyroclastic deposits of the Quill suggests that the Quill began forming around 50,000 years ago. Stratigraphic Division 7: The most recent erupted bedset (about 1,600 years B.P.). Stratigraphic Division 6: Upper mixed division (undated – less than 7,000 years B.P.). Stratigraphic Division 3: Phreatomagmatic ashes (around 8000 years B.P.). Stratigraphic Division 2: Lower mixed pumice division (around 23,000 years B.P.). Stratigraphic Division 1: Base surge deposits (less than 40,000 years B.P.). The last erupted bedset of the Quill ( Division 7) is particularly well exposed and the five pyroclastic layers have been mapped individually. They have been named marker Units K (oldest) to Unit O (youngest). These deposits are dominantly pyroclastic flows and show a systematic change in chemistry from andesite at 58% SiO2 up the stratigraphy to basalt at 51% SiO2. Early formed mixed-magma deposits (Marker Unit K airfall and flow units) show both dark colored basaltic andesite and light colored andesite flow banded together within single clasts, suggesting that the eruption was triggered by the introduction of basalt into an andesite chamber followed by mixing and hybridization with subsequent emptying of the chamber. Our interpretation of the radiocarbon ages (including Indian settlement ages) suggests that the last erupted bedset probably formed between 1755 and 1635 years B.P. Six recently-drilled water wells in the flanks of the Quill have revealed heated groundwater suggesting that the Quill is dormant. 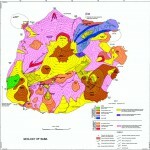 Petrographically the Northern Centers comprise a single group of homogeneous andesite lavas with a silica range of 59.7% to 60.4%. In contrast volcanic components of the White Wall range change from basaltic andesite (56.1% SiO2) near the base up the stratigraphy through andesite to dacite (63.7%SiO2). The overlying Sugar Loaf succession shows a more restricted range from dacite (64.2% SiO2) at the base of the succession to rhyolite (71.2 % SiO2). Petrographically, the Quill shows the greatest silica range of all Lesser Antillean volcanoes ranging from basalts (50.4% SiO2), through basaltic andesite, andesite, dacite to high silica soda- rich rhyolite (72.3% SiO2). The three volcanic components of St. Eustatius (Northern Centers, pyroclastic deposits of the White Wall-Sugar Loaf ridge and The Quill) show a varied geochemistry. The volcanic rocks of the Northern Centers – White Wall-Sugar Loaf form a distinct chemical trend that ranges from basaltic andesite and andesite of the low-K calc alkaline suite to dacite and rhyolite of the medium-K calc alkaline trend. 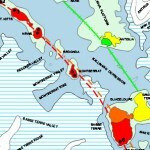 That is the single chemical trend crosses field boundary used in classifying calc-alkaline magmas. 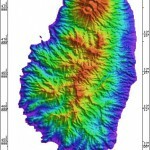 In contrast the Quill situated only 35km from Saba and coeruptive with that island over the past 50,000 years, differs from Saba by erupting a low-K calc alkaline magma series. St. Eustatius is unique in the Lesser Antilles in that rhyolite evolved twice in its history, first in the Sugar Loaf and then later in the Quill pyroclastic succession. An estimate of the time required for a basaltic magma chamber to fractionate to produce such rhyolites is around 30,000 years. Like Saba the pyroclastic deposits of the Quill contain a suite of ejected blocks derived from the underlying submarine bank which includes Tertiary fossiliferous limestone and green metavolcanic rocks. However unlike Saba the deposits of the Quill lack the rounded hypabyssal nodules. Instead, and again unlike Saba , there are coarse-grained plutonic blocks of igneous cumulates of the type found on the floors of magma chambers. From these differences it is concluded that the Quill is underlain by a magma chamber in which crystal fractionation occurs to produce a wide range of lava compositions. 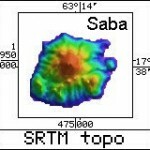 In contrast Saba is believed to be underlain by a system of parallel dikes emplaced into a fault zone. This conclusion of the contrasted crustal plumbing systems of the Saba and the Quill (represented by hypbysssal nodules and plutonic blocks respectively) has now been applied successful to other volcanoes of the Lesser Antilles where for example the Soufriere Hills volcano at present erupting on Montserrat is similar to Saba whereas Mt. 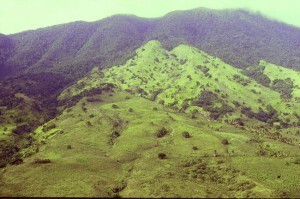 Pelee, Martinique that erupted in 1902 and 1929 is similar to the Quill. For a more detailed description of the volcanology of St. Eustatius the reader is referred to: Roobol, M.J. and Smith, A.L., 2004, Volcanology of Saba and St. Eustatius, Northern Lesser Antilles, 2004, Royal Netherlands Academy of Arts and Sciences (Koninklijke Nederlandse Akademie Van Wetenschappen), Amsterdam , the Netherlands , 320pp. The latter is available at website: www.knaw.nl/edita/antilles. For an up to date evaluation of the volcanic hazards, the reader is referred to the soon to be published: Lindsay, J., Robertson, R., Ali, S. and Shepherd, J. (Eds. 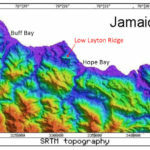 ), in press, Volcanic Hazard Atlas of the Lesser Antilles: Seismic Research Unit, University of the West Indies, St. Augustine, Trinidad, W.I.